Bags you can make: Homemade T-Shirt: Why Not? 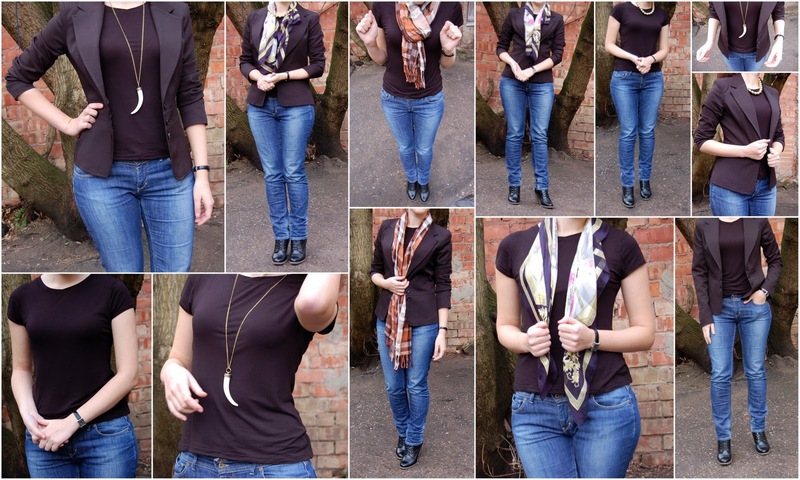 It might have been a bit too boring to show you simple T-shirt, so I prepared some outfits by using same T-shirt (made by me), jeans, watch and shoes matched differently with 2 scarves, 1 jacket and 2 necklaces. (Click on photo to see bigger view). Now if you would add different hair-dos', earing, shoes and etc. you can create infinite number of outfits based on one basic T-shirt! T-shirts are considered to be a wardrobe necessity and I couldn’t agree more. Having some basic T-shirt in simple colors like white, black or grey can easily expand your clothing choices as you can wear the same t-shirt with jeans, pants, skirts, hoodies, jackets and etc. and look different each time. I’ve noticed that many home sewers don’t like making this clothing as it’s “too simple” or “boring” and “why bother making them when it’s easier to go to any clothing store and buy some for a little price”. However, I am one those people who gives a huge plus to homemade T-shirts. And let me tell you why. It’s a general thinking that there is one type of T-shirt and the variety of shirts is so big only because they come in different colors and with different pictures. In reality, there are many different types of T-shirts: with different necklines, different length, different fit… Because having a basic T-shirt is quite essential (at least for me), the shirt has to look perfect on you. This means the length has to be perfect, the fit has to be right, the neckline has to be carefully chosen, sleeves have to be comfortable and the color has to compliment your face. You may think that these are just small unimportant details, but believe me, they make a huge difference. Now what are the odds that the T-shirt in a store is going to be perfect for you in every way and will look as it was made for you? Very small odds, I believe, if you don’t have the perfect 90-60-90 figure (or whatever the perfect figure is). The next thing I’d like to point out is the quality. I cannot tell you how many T-shirts I’ve bought in recent years that I had to throw away after less than one season due to low quality (yep, I want my clothes to last long, therefore garments just for one season are not suitable for me). It’s quite hard to predict the quality because it shows its “true face” only after wearing it: sometimes the fabric washes out, sometimes it stretches out and sometimes the shirt turns out to be wrongly cut (or whatever that is that makes them turn around waist…). When you are making a T-shirt (or any garment) you are the one who is responsible for the quality and you can make it as well as you want. I am not saying that all shirts in stores are bad, because there are so many good ones, but the ones that look perfect on me and are well made usually have a high price tag. These points led me to making my own T-shirt. I had a thought to make a shirt by myself before, but I thought my very simple sewing machine couldn’t handle it. Turns out – with a little persistence - it did a decent job. So why not take some nice stretchy cotton the next time you’re in a fabric store, spend one evening with sewing machine and make a couple of perfect T-shirts? Small details – big difference. P.S. I'd like to send a huge "Thank you" to my friend, who not only took the photos, but also gave both necklaces and one scarf for the photoshoot and had to deal with my very very low skills of modeling while it was just about +2 degrees Celsius outside ;D Thanks dear!